15984LF-ECO is rated 4.3 out of 5 by 13. 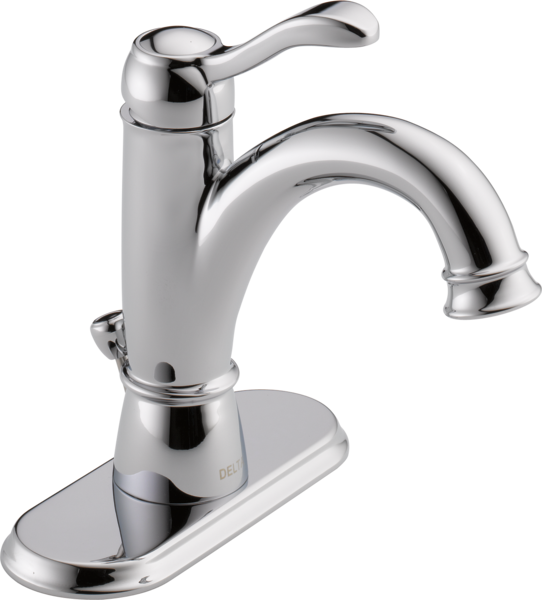 Rated 1 out of 5 by Bobby from Faucet is okay but Escutcheon is not Bought the faucet over a month ago. It is a one hole install. The first countertop we ordered was wrong size but had one hole as requested. 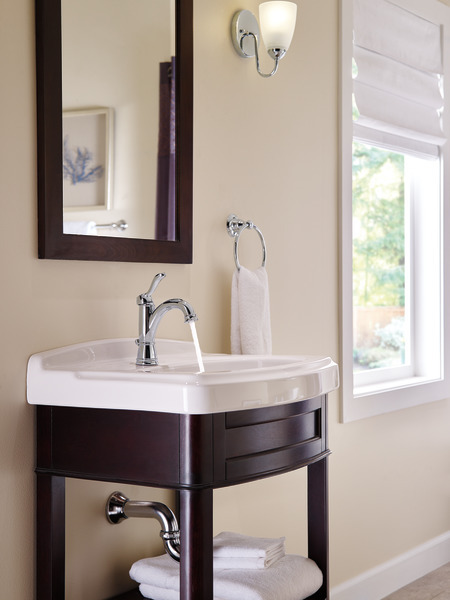 the second countertop was the right size but had three holes and the faucet would not fit. Drilled out the hole to allow for the screw that secures the faucet. Installed the faucet tightening the nut 1/4 to 1/2 turns until snug. Faucet was not solid in place and still moved. continued tightening at 1/4 turns of the nut and still the faucet would not secure. The Escutcheon plate warped under the pressure. I am going to try to straighten it and reinstall. 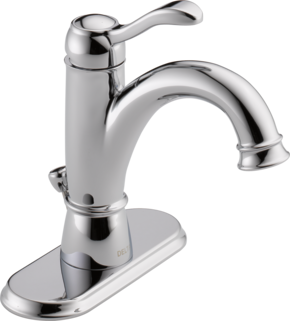 I believe the biggest part of the problem is the half-moon bracket does not apply even pressure all the way around the faucet because the faucet never would stop moving. 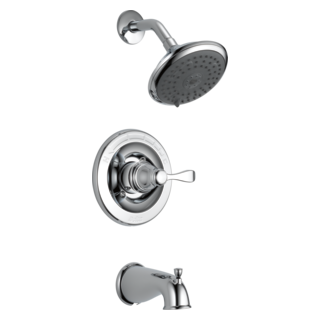 Rated 3 out of 5 by Slow trinkle from Hidden Aerators My bathroom faucet aerator needs to be cleaned but I cannot find the specialized wrench to remove the aerator. 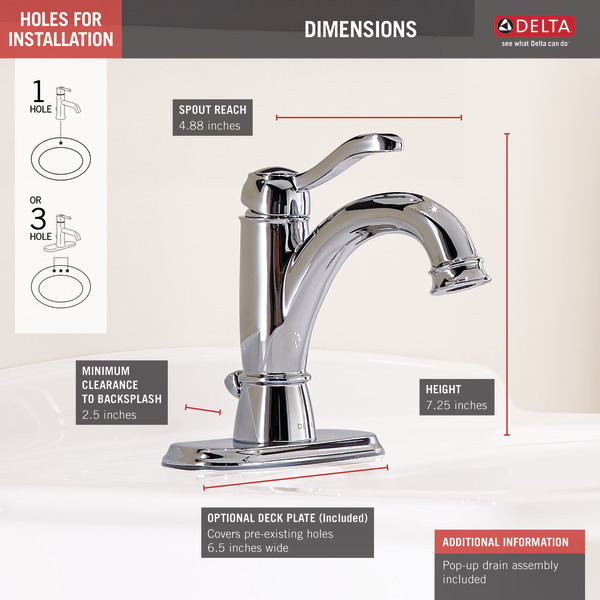 They come in different sizes, so...don't lose the tool that comes with the faucet you buy. Rated 5 out of 5 by huntperch from Works great and looks great Really turns off and on easy. Looks really nice. Very happy so far. Rated 4 out of 5 by Oldman from Smooth operation I bought it 2 weeks ago and really like it. 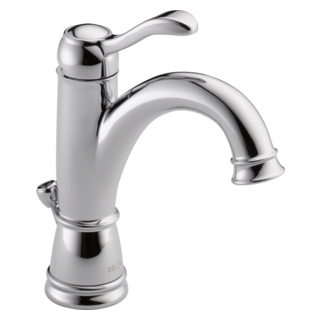 Rated 5 out of 5 by HandyDave48 from Love the simple design Love the simple design of these faucets, the operation is very smooth, they were easy to install. 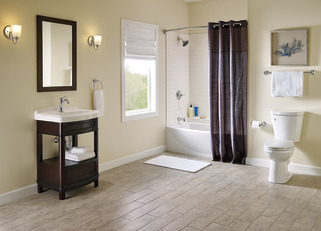 Rated 5 out of 5 by oldlars from just what we wanted After ten years my wife is finally getting her bathroom makeover..I am using a black walnut live edge 2" slab from my property for the vanity top. We chose a white vessel sink that sits on top the slab. We are also having our claw foot cast iron tub re-finished. The faucet we chose had to look like our tub faucet. 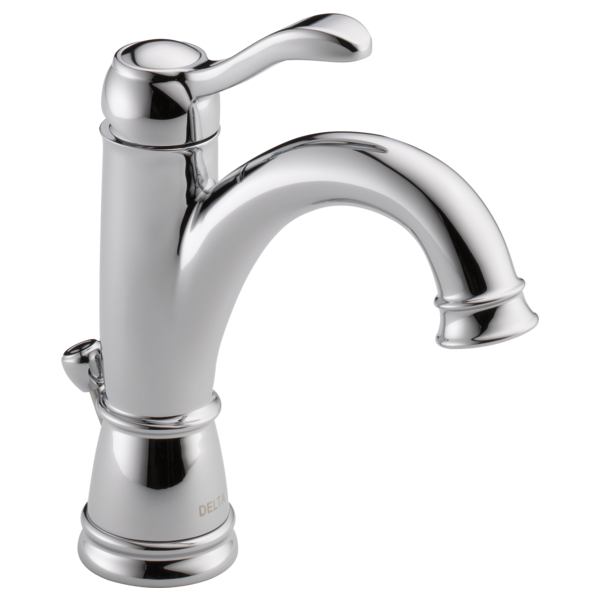 The Delta faucet worked just right.. Rated 5 out of 5 by dpaul65 from The faucet was sleek, clean lines, and perfect color Got this faucet because it matched our décor and really operates smoothly. I need the drain tube without the overflow tube holes bronze color. What can I use to remove the cap in order to remove the handle. The cap is a very tight pressed fit. Is this available with a metal drain? The half moon shaped plate that secures the faucet to the bottom of the sink with a nut has round depressions on one side and dimples on the other. Which side of the plate should be in contact with the sink? What size key and recessed aerator does the porter bathroom sink faucet take? Or better yet, what part number key and aerator should I order? 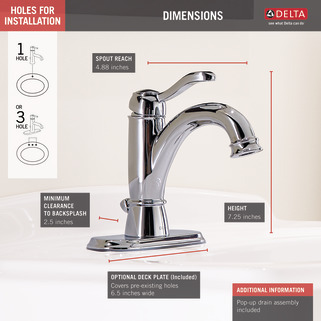 I have a delta porter bathroom faucet with a clogged aerator. What is the difference between 15984LF-BN-ECO and 15984LF-BN (non-eco)? Is there a restriction I can remove from the ECO model to make it a non-ECO? Can the stopper be removed for cleaning? &nbsp;Drain running very slow, have tried several drain cleaners which didn't help. &nbsp;If so how can it be removed with getting a plumber? can I do a pop-up drain with this as I don't have 2 1/2 inches of clearance from the backsplash?